Imaging for Windows provides the Imaging component for Microsoft Windows XP, Vista and Windows 7 and 8. OpenText Global 360 Imaging for Windows 4.0 has desktop imaging functions in a single, easy-to-use application that enables users to scan, edit and store paper-based documents. With Imaging for Windows, users can easily convert paper-based information into digital documents that can be viewed, edited, OCRd, distributed via email, and posted to or downloaded from the Internet. Compatible with Microsoft® Windows 7, Windows Vista® and Windows® XP, Imaging for Windows 4.0 introduces a range of new features that enable greater efficiency and productivity, most notably the ability to view and print PDF files and a new Multiple Document Interface (MDI) within the application viewer that lets you display multiple documents at the same time, with each document displayed in its own window. This enables you to work on different document types using a common viewing platform. For example, you can view both a TIFF image from a scanning application and a PDF document on the same screen at the same time. The Imaging for Windows Developer Resources is a separately packaged and licensed offering that enables organisations to leverage powerful, highly-developed ActiveX controls to create robust custom applications with integrated imaging capabilities. The Imaging for Windows ActiveX controls enable software developers to add imaging capabilities to custom applications and programs that support ActiveX, including the Visual Basic (VB6) and Visual C++ programming languages. • Image Administration Control (imgadmin.ocx) – Administers image files, provides common dialog boxes for image operations, and manipulates pages within an image file. • Image Edit Control (imgedit. ocx) – Displays, annotates, manipulates, and manages image files. • Image Annotation Tool Button Control (included with imgedit.ocx) – Adds text and graphical annotations to displayed image files. • Image Scan Control (imgscan.ocx) – Scans paper documents via TWAIN-compatible scanners. • Image Thumbnail Control (imgthumb.ocx) – Displays thumbnail views of images contained in an image file. • Image OCR Control (imgocr.ocx) – Converts image files to formatted, editable text. TWAIN-compliant device (optional) and fax/modem card (optional) to take advantage of Global 360 Imaging for Windows scanning and faxing capabilities. Imaging for Windows was formerly known as Kodak or Wang Imaging Professional or Imaging for Windows. 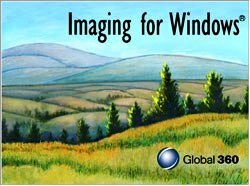 Imaging for Windows was included as part of Microsoft Windows up to and including Windows 2000 and is now available for XP, Vista and Windows 7 and 8. A software development kit 'Imaging for Windows Developer Resources' is available to allow integration with your own software. Supplied as an ActiveX, it is compatible with several programming languages including Visual Basic (VB6). Imaging for Windows is not included in Windows XP, Windows Vista or Windows 7.